Black Widow Movie: Johansson Wants it to be "Totally Different" | Nerd Much? 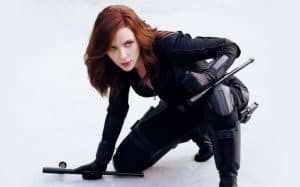 If a Black Widow movie comes to fruition, actress Scarlett Johansson want the movie to be “totally different” from previous Marvel movies. Fans have been clamoring for a solo Black Widow movie since the character first made her on-screen appearance in Iron Man 2. Kevin Feige has previously stated their commitment to make that happen, but nothing have been officially announced. Still, that doesn’t stop Johansson from voicing her opinion. In an interview with Variety, she confirmed that there have definitely been conversations about it. If Marvel wants a standalone Black Widow movie, they will have to act soon. Johansson explained that she would want to do it while she still feels comfortable in her skintight suit. She isn’t sure how much longer she could do that. In our personal opinions, Johansson has nothing to worry about. We love the idea of a solo Black Widow story. She has become such an important part of the team, yet we still don’t know much about her. Hopefully we’ll here something in the coming years.